Grundix DP is a high quality polymer dispersion. It is characterized by a fine particle size, which allows for deeper penetration into the substrate. Grundix DP provides good adhesion, sealing surface, strengthens the foundations, regulates absorbing ability. Grundix DP does not contain solvents. Strengthens all highly absorbent substrates: gypsum, lime, cement plasters and mortars; gypsum board; aerated concrete; ceramic and stone finishes; smooth concrete slabs. Before applying Don Latex, putty, plasters, tile adhesives, wallpapers and insulation panels. Grundix DP is available in packs from 1 kg and 5 kg. Grundix DP has a shelf life of 12 months if stored in proper conditions, at temperatures range between + 5°C and 30 °C in its original unopened packing. Protect from freezing. Protect against direct sunlight. 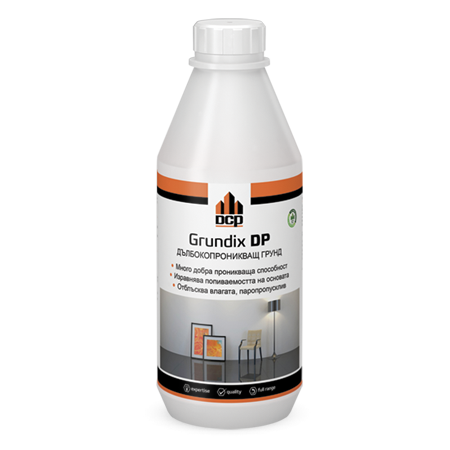 Grundix DP is used only in dry conditions at temperatures of air between +5 °С and +35°С. Not applicable on wet and frozen surfaces, and on directly sunlit walls. The material is sensitive to low temperatures. Do not store, transported and applied at temperatures below +5°С. Surfaces should be clean, sound, dry. As well as free from oil, grease, dirt and loose particles. Before applying Grundix DP is necessary to test the strength of the base. Grundix DP is applied directly by brush, roller or spray machine. Grundix DP is used diluted with water in various proportions depending on the porosity of the surface. Dense surface - 1:5, porous substrates - 1:2. Concentration and amount of Grundix DP must be such that fully absorb into the base without forming a surface layer. Should be left to dry completely. Depending on the specific conditions the following works can be carried out not earlier than 3 - 6 hours after application of Grundix DP. All tools and equipment should be cleaned immediately after use with clean water. Grundix DP does not fall within the list of dangerous substances according to current regulations. In case of contact with eyes wash immediately with plenty of water and seek medical advice. Sprayed places on the skin should immediately be washed with water.